Welcome to Winnie & Walter’s October new release premiere! This release going to be HUGE and AWESOME! Today is day #1 of the premiering the new products. Make you self a cup of coffee or tea and enjoy! On day #1 we are premiering three beautiful stamp set and five new word dies. The stamp sets are called In Bloom: Anna’s Flora, In Bloom: Elsa’s Flora and In Bloom Renee’s Leaves. The dies are called In a Word: Home, In a Word: Joy, In a Word: Merry, In a Word: Peace and In a Word: Thanks Cutaways. The stamp sets are beautiful with lots of floral and leaves outline images. These are the perfect for watercolouring, colouring with copics, noline colouring…. I LOVE them so much. A must have in you collection of floral stamps. The Cutaways are big, bold and perfect on any card. I have couple of cards to share using today’s premiered products. 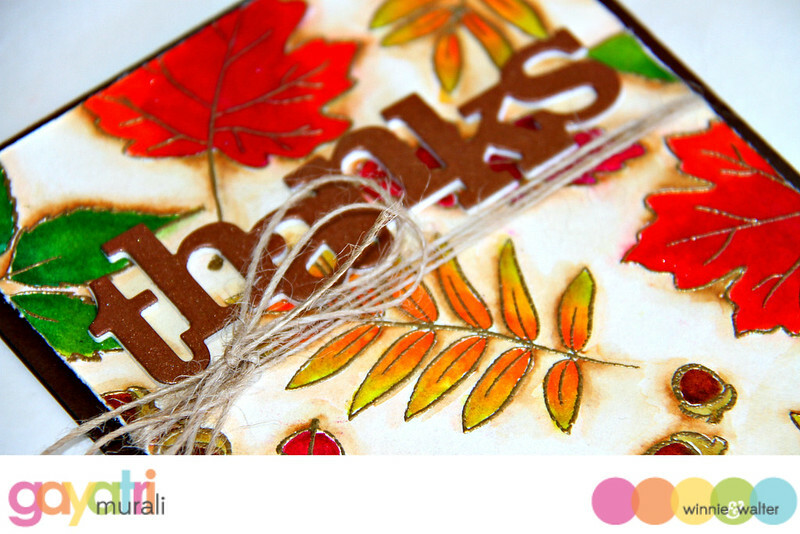 My first card uses In Bloom: Renee’s Leaves and In a Word: Thanks Cutaway. I used Autumn/Fall colour to make my card. I started with watercolour cardstock and gold heat embossed the leaves and nuts randomly. Then I used Zig clean brush pens to colour them directly and blend. No water used inside because I wanted the colours to be intense. I particularly like the green and orange blend on the leaves. For the background, I have added some brown colour for shadows and highlighting. I then trimmed the panel quarter of an inch smaller than the card front and roughed the edges with scissors. For the sentiment, I die cut the In a Word: Thanks using a brown shimmer cardstock I had in my stash and three more using white cardstock. I stacked glued them to give dimension and adhered on the panel. To add texture to the autumn/fall themed card, I wrapped around some jute thread and made a bow. This panel is adhered on a brown card base. Here is a closeup of the card. Hope you like my first card. Now my second card is a Christmas card! I wanted to do some masking to cluster the images from In Bloom: Elsa’s Flora stamp set to make a focal point. So I stamped the Poinsettia to start the cluster, masked the image to stamp the leaf, masked the leaf to stamp more leaves, then berries and sprigs etc. I then coloured them with copic markers. Then I used In a Word: Merry cutaway to die cut right in the middle of the cluster. I also die cut four more of the Merry using white cardstock then stacked and glued them all with the coloured image die cut on the top. I adhered an adhesive sheet behind the negative panel and in laid the die stck back in place including all the bits and pieces. Note: I did not stack glue the bits and pieces. Here is closeup of the inlaid diecut. I stamped the secondary sentiment from another new stamp set on a strip of white cardstock and adhered using foam adhesives. 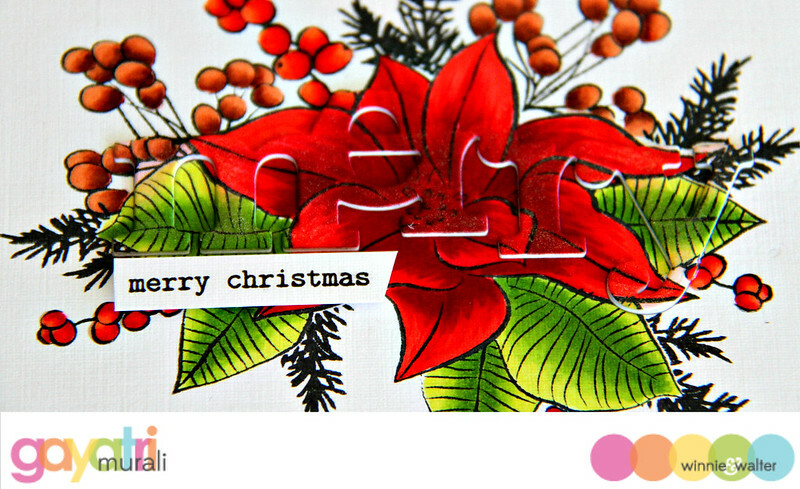 To add to the festivity, I brush the inlaid die cut with Wink of Stella clear shimmer pen. I stamped the woodgrain image from a new stamp set using brown ink towards the bottom of the card front. Then, I trimmed an inch off the bottom of the main panel and adhered the panel on the card front using foam adhesives. I also added glossy accent to the berries. Are you liking what you are seeing? If you want to see more inspiration, check out Winnie & Walter Blog for more from the design team. Make sure you write down your list to buy 🙂 If you want these new sets and dies premiered today, then leave a comment on Winnie & Walter Blog to enter a chance win. More details are on Winnie & Walter Blog. Both of these are GORGEOUS!!! LOVE the gold embossing and beautiful colors on the first one, and the rich colors on the second one! Beautiful! Beautiful and intense colours on thes gorgeous cards! Lovely new W&W sets! Oh my gosh, Gayatri, stunning, stunning red poinsettia! I just love how intense your colors are! Can't wait to see the rest of your projects!! Beautiful cards!! My favorite is the Christmas card!! 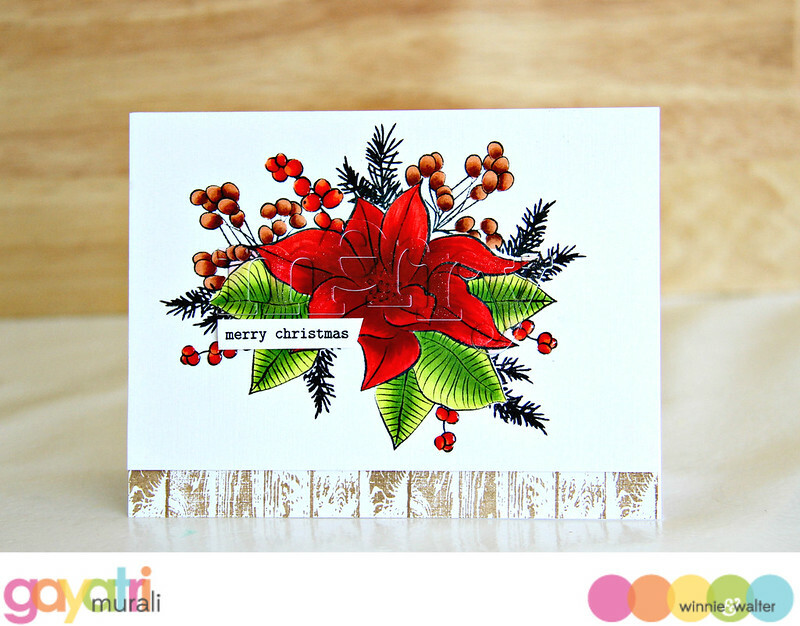 Love the bold colors and the poinsettia is gorgeous!! So gorgeous and vibrant, I love both designs! Gayatri, these both really POP with vivid color. I adore the leaves as well and the pretty flower stamping. You're so talented. Gorgeous cards Gayatri, the colors are fabulous!! These are both STUNNING, Gayatri, marvelous work!!! Julie, you can buy directly from their online store. Not sure if any store in Australia stock them. 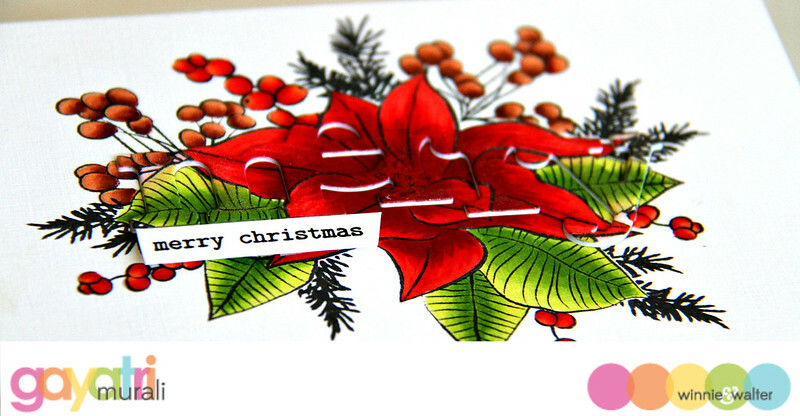 LOVE your BEAUTIFUL leafy thanks, LOVE your DELIGHTFUL very merry Christmas card too, BOTH designs are STUNNING and the colours SO VIBRANT!!! I love the colors you used and how you have the wording blended into the flower!